As a business owner, have you ever thought about growing your business in another country? Why not create a partnership with Serbia? Slavica Joković is a Serbian Public Procurement expert that outlines the ins and outs of how businesses can grow through the procurement process. Being equipped with Winning Public Procurement Contracts In Serbia Manual by Slavica Joković is a great starting tool. This guide informs the reader about what it takes to be in partnership with the Serbian government through the procurement process, from understanding Serbian contracting and how contracts are awarded to learning about the 5% special bid preferences. Slavica Joković provides Frequently Asked Questions (FAQs) that offer detailed explanations on how to get into the game and win the bid. With a diverse knowledge of the procurement process in the U.S., I fully understand the essence of how the procurement process works. It appears that by reading Winning Public Procurement Contracts In Serbia Manual by Slavica Joković, there are some universal ways to successfully sell your goods and services to your ideal customers - whether they are within your country or abroad. 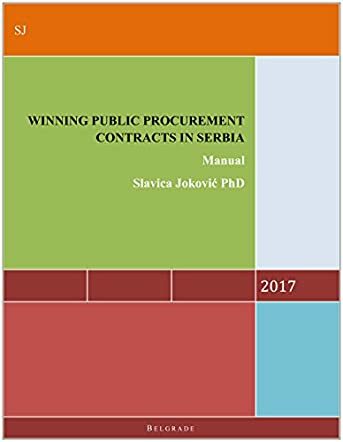 Winning Public Procurement Contracts In Serbia Manual by Slavica Joković contains everything for a business owner’s needs. Clearly every state and country has some type of procurement program where business owners can both benefit and thrive - the main objective is that if they understand the system and process of partnering, everyone wins.